Measles is a sickness that first makes you feel sick, with a fever, a cough, and a runny nose. Then it gives you a rash all over your skin. It is caused by a virus, and you usually catch it by touching a person with measles, or touching something they touched, or from sneezing or coughing. Measles is very easy to catch. Nine out of ten people who come in contact with measles viruses will catch the disease. But most people get better on their own. In the Middle Ages, probably about one out of ten people who got measles died, mainly people who were not getting enough food before they got sick. In places with modern food and health care, almost everyone gets better from measles. Once you have had measles, you can’t get it again. 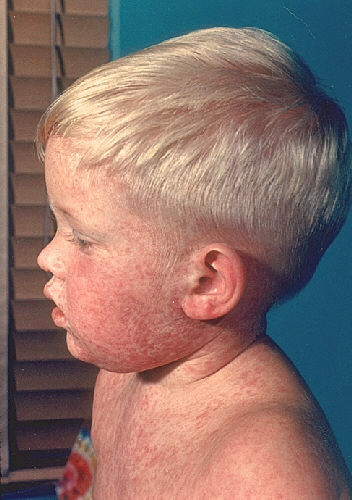 Like many other diseases, measles started as an animal disease. 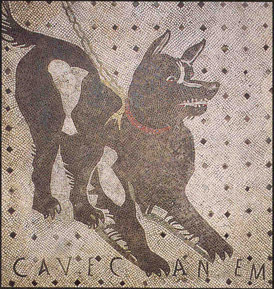 It was probably related to distemper (a dog disease). Because people lived with dogs, at some point measles evolved to attack people as well. This would have happened around the time that people began living in cities. Cities provided the big population that the measles virus needs to keep it going. (Otherwise it dies out). That may have happened around 2000 BC, in West Asia. At first measles was a serious disease that killed many grown people. The earliest mention of measles may be the plague of Athens of 430 BC described by Thucydides. (Although some people think that was more likely to be typhoid fever.) There were outbreaks of measles in the Roman Empire, too, the first one maybe in 165 AD. The Roman doctor Galen describes a serious outbreak of what seems to be measles that began in Carthage (in North Africa) in 251 AD. 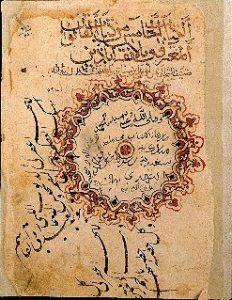 The Iranian doctor Al Razi wrote the earliest scientific description of it about 900 AD. He also explained how to tell measles from smallpox. But Al Razi thought that measles and smallpox were two different parts of the same sickness. A little later on, Ibn Sina realized that you caught measles from other people. By the 1500s, most grown people in Europe, Asia, and North Africa had already had measles, and so they were immune to it. So measles became a sickness that mainly children got in those places. The worst measles plague was when European traders and explorers gave measles (along with smallpox) to the people of North and South America in the 1500s AD. Because this was a disease which nobody in America had ever had before, nobody had any resistance to it. Measles and smallpox together seem to have gradually killed about nine out of every ten people living in North and South America. 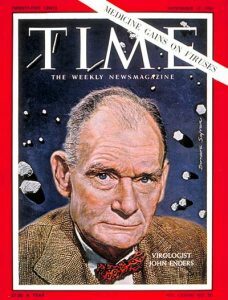 In the 1950s, John Enders of Boston succeeded in making a vaccination against measles, and, beginning in the 1960s, nearly every child in North America and Europe was vaccinated against measles. Hardly anyone in modern North America or Europe gets measles anymore, because most people have been vaccinated against it. But there is still no cure for measles if you do get it, and many people do still get measles – in modern Japan, for instance, most kids are not vaccinated against measles. Cite this page: Carr, K.E. What is measles? History of diseases and medicine. Quatr.us Study Guides, September 7, 2017. Web. April 25, 2019.